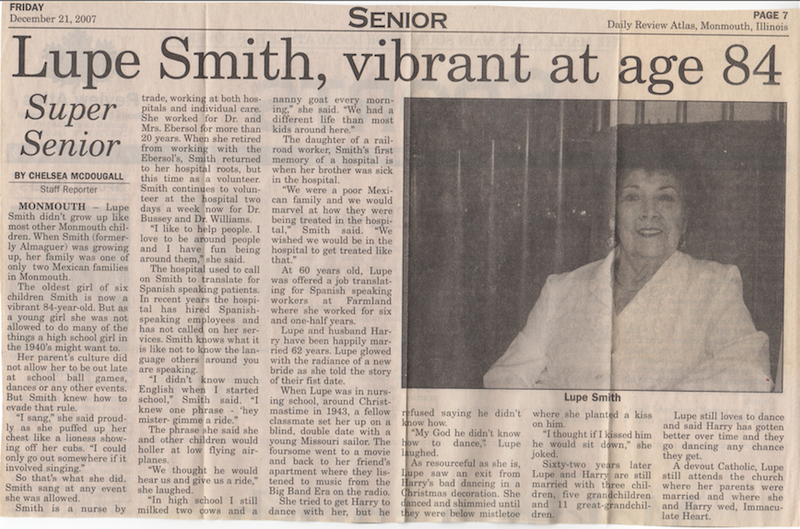 After a long life as a community leader, Lupe Smith passed away at the age of 86 in 2009. Even after her death, Lupe continues to inspire community members to give back to the community. Among the citizens who have been inspired by Lupe's work, Susan Twomey says that Lupe "represents something that I'm trying to do, which is to bridge gaps." With Monmouth's population growing increasingly diverse in recent years, Susan feels that it is important for the community to embrace cultural differences and celebrate the diversity which is so rare in small Midwestern towns. In addition to dedicating her life to community service, Lupe also worked to preserve her own personal history. Hoping to share her life and heritage with generations to come, Lupe wrote an autobiography, which she titled, "Memories." Although she intended to record her own personal history, she created an invaluable historical narrative detailing the history of Monmouth. Lupe's obituary was published in the Review Atlas in February, 2009. Lupe was featured in the Daily Review Atlas in 2007 as a "Super Senior." The article includes memories of growing up in one of only two Mexican families in Monmouth, the story of meeting her husband Harry, and her love of singing and dancing.